The whole world would benefit from farmers in Afghanistan replacing poppy farming with alternative crops. 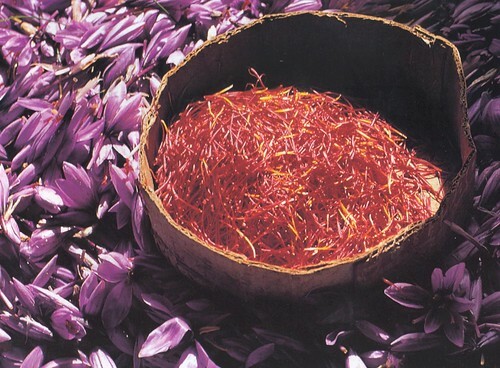 Saffron yields about the same price as poppy and would hence be a viable possibility. Saffron surrounded by saffron blossom. To induce poppy farmers in Afghanistan to grow saffron instead of poppy would benefit the world at large. Other high-value high-volume alternatives are pomegranates, almonds and grapes. Catch is that the start-up period for such crops is too long. Establishing a grape vineyard there would take about three to five years. Obviously that’s not appealing to impoverished farmers. Not least since buyers of poppy provide them with monetary guarantees up front. Another huge barrier in revitalizing the legal agriculture sector is the ongoing peace crisis. And poppy, unlike alternative crops, is harvested annually which also make it more lucrative for the farmers. But is enough focus being made by aid organisations to change farmers’ minds as well as give them monetary guarantees up front for changing crops? Experts believe much more could be done in that respect. So maybe it would be a good idea for aid organisations to start coordinating their efforts to have a major impact? Reducing the amount of poppy exported out of Afghanistan would benefit the whole world as well as contributing to making the country a better, and safer, place for the Afghan people. This is actually one of those unusual situations where aid would have positive affects around the globe. So wouldn’t it be good for the world community at large to pull toghether and start channeling more aid into compensating Afghan farmers for turning to, say, saffron? What do you think? Should the world community make an effort by channeling aid to compensate Afghan farmers that change to alternative crops? Or should the poppy farmers just stick to poppy while we wait for peace in the area? Throughout history Afghanistan has been a challenge. Waiting for peace to come may be futile. So wouldn’t it be a good idea for the world to finally unite when it comes to Afghanistan and make an effort to do something to improve the situation in the country that doesn’t involve arms? I think saffron is better than opium. I have read a lot of articles about this and these are more favorable to saffron. Regarding your question about the effort to do something to improve the situation in the country that doesn’t involve arms, I think the people involved should really think about it properly. When would peace reign in the country? When all the people have already died? Think and act now properly. Agree with you Dagmar. Unfortunately though I believe that after being at war for such a long time changing Afghanistan is easier said than done. Too many war lords are in control. ANd not to forget the Taliban and other entities with interest in controlling the country, drugs trade, gem stones and so forth. Thank you Julia. Glad you agree with me. True. The empire may be gone, but the American spirit, that made America great, will survive. Hopefully the only the good aspects of the American spirit will survive. Because those part of the American mentality really enable development. The bad aspects though are ruthless. But that's the way the world has always been and most likely always will be. Someone said there is always a balance of good and bad in society. Sadly, true. But let's not forget there is an inherent justice in the functioning of the Universe. As they say in America : " There is no such thing as free lunch". Sooner or later, one has to pay a price for everything. The law applies to individuals as well as nations. History is replete with examples of mighty nations biting the dust when they, in their arrogance of power, ignored the Universal laws of Justice. No nation however mighty is immune from this Universal law. Let's not lose hope that one day "the meek will inherit the earth". God willing. Yes Zafar, empires come and go. And the US empire is, as we know, leaving way for China, India and Saudi/the Gulf. Just a question of how long it will take. The US is only interested in securing an oil/gas pipeline route across Afghanistan to pakistan/India bypassing the Russia/Ukraine route. They have no real interest in improving the lives of ordinary Afghans. We can come up with all the good ideas in the world but it won't make any difference to the US. Yes it all boils down to Zbigniew Brzezinski's ideas doesn't it? "The Grand Chessboard: American Primacy And Its Geostrategic Imperatives" was written a long time ago, but its ideas are still implemented. As usual you have come up with a brilliant idea, and I agree with the thrust of your argument. However, unfortunately, the reality on the ground in Afghanistan is different , and unless NATO ( read United States) realizes it, the situation in Afghanistan is going to get worse and worse. • Build schools and provide support for education. • Invest in small scale manufacturing, help build factories. • Build roads and infrastructure that has been destroyed by 30 years of warfare. • Stop supporting warlords and corrupt politicians. And , of course, US should introduce alternate cash crops to Afghanistan and train the farmers how to cultivate them, and then open the markets in the West for such crops. Such initial investment would yield tremendous returns for the US. It will not only save the US and its Western allies billions of dollars in war expenditures, which are all going to waste, hurting their economies, but they will have a nation eternally grateful to American for transforming their lives. Once Afghans have stake in their country's economy and its infrastructure, and once the population is gainfully employed, they will protect their livelihood and their live style. And the United States and the West will have a peace-loving and grateful nation and an ally in the region. Like what just suggest Zafar. Excellent ideas! What a fantastic article. I love that you came up with a viable solution that works for everyone. Keep writing and voicing your ideas! Glad you like it Laura! A great idea, Catarina. The issue is going to be persuading the Taliban of the merits of saffron over opiates as it seems that most of the production in Afghanistan is done under their dictate ("grow it or die") – this being a major source of funding for their activities. Replacing opiates with saffron won't, of course, reduce the funds they raise but will help reduce the amount of heroin in the world. What we really need to do is find a way to remove the Taliban threat from the farmers. That, I fear, is a more difficult problem. Good comment Guy. We all want to get rid of the Taliban. However, since they don't control the whole of Afghanistan I do believe it would be a good idea for aid agencies to make a major effort to compensate farmers for changing to alternative crops in areas where it's possible to so.